The upheaval wrought by the 22 February earthquake in Christchurch, NZ, is illustrated in new radar imagery. The Magnitude 6.3 tremor killed more than 160 people and shattered a city already reeling from a previous seismic event in September. Data from the Japanese Alos spacecraft has been used to map the way the ground deformed during the most recent quake. It shows clearly that the focus of the tremor was right under the city's south-eastern suburbs. The type of image displayed on this page is known as a synthetic aperture radar interferogram. It is made by combining a sequence of radar images acquired by an orbiting satellite "before" and "after" a quake. The technique allows very precise measurements to be made of any ground displacement that takes place between the image acquisitions. The coloured bands, or fringes, represent movement towards or away from the spacecraft. In this interferogram, the peak ground motion is almost 50cm of motion towards the satellite. "It's like a contour map but it's showing to the south-east of Christchurch that the ground motion is towards Alos. That's uplift," explained Dr John Elliott from the Centre for the Observation and Modelling of Earthquakes and Tectonics (Comet) at Oxford University, UK. 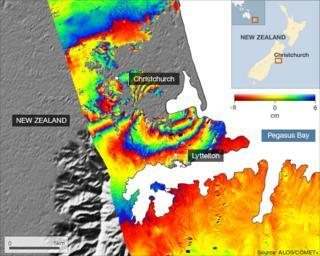 "And then right under Christchurch, we see subsidence. That's partly due to liquefaction but it's mainly due to the way the Earth deforms when you snap it like an elastic band." Where the rainbow fringes become most tightly spaced is where the fault break came closest to the surface, although the data indicates the fault is unlikely to have broken right through to the surface. Liquefaction is a phenomenon that afflicts loose sediments in an earthquake and is akin to a lateral landslide. It is a major issue for Christchurch because the city is built on an alluvial plain, and this type of ground will amplify any shaking during a tremor. Scientists are using the Alos information to understand better the future seismic hazards in this part of New Zealand. It has become obvious from recent events that Christchurch sits close to "blind" faulting - faulting that is at risk of rupture, but which betrays little evidence of its existence at the surface, meaning the potential danger it poses is not fully recognised. "It means much more work needs to be done around Christchurch," said Dr Elliot. "People knew they could get earthquakes further into the mountains [in the west of South Island]; that's how they've been built in some ways, through earthquakes and all the faulting. "But to get an earthquake right under their city will have been a surprise to nearly every single person." The interferogram is noticeably incomplete - there are several areas where the fringing is missing. There are a number of reasons for this. To the east is ocean, and this technique does not work over water. To the west, the issue is related to the satellite track and the fact that it views the Earth in strips. Hence, you get bands of data. But the more interesting and more relevant omissions are in Christchurch itself. Dr Elliot commented: "Here, the patches are the result of de-correlation between the acquisition images, where we just can't match them - they're too different. "There are a few reasons for that. Usually it's the result of vegetation growth, but here it could be due to more extreme shaking or liquefaction." Researchers are investigating the relationship between September's Magnitude 7.1 quake and last month's 6.3 event. The latter is very much considered to be an aftershock from the former, even though they were separated by six months. The September quake occurred about 40km to the west, rupturing a similar length of fault. The most recent tremor ruptured about 15km of fault. What scientists need to know now is the nature of any "seismic gap" between the two; that is, a segment of fault which was not broken in either tremor but which may have been loaded with additional strain because of both those events.